You know how your gas gauge gives you that warning that you need to gas up, but you believe you can go that extra mile because you know your car and know just how many more miles you can go before you are really out of gas? Yup, that’s what I did this past week…..but not in my car……on a knitting project. 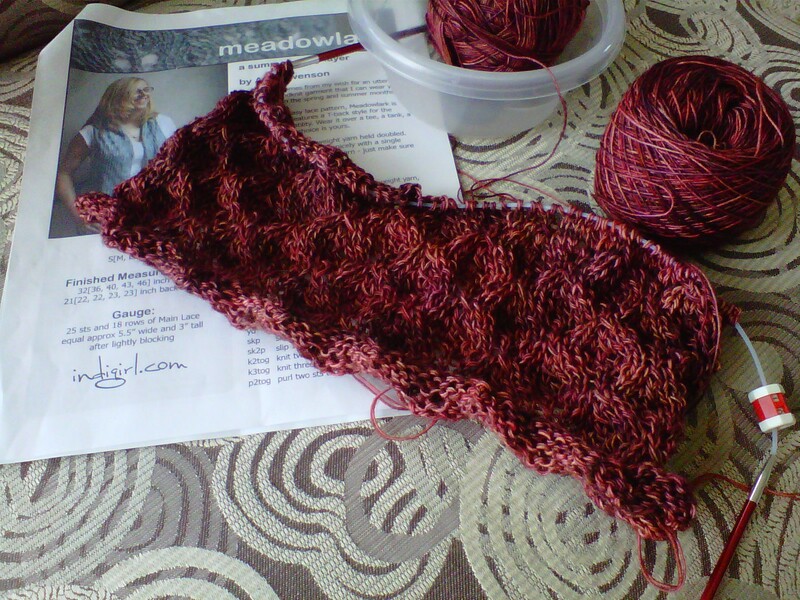 It all started with a really cool vest pattern called MeadowLark. 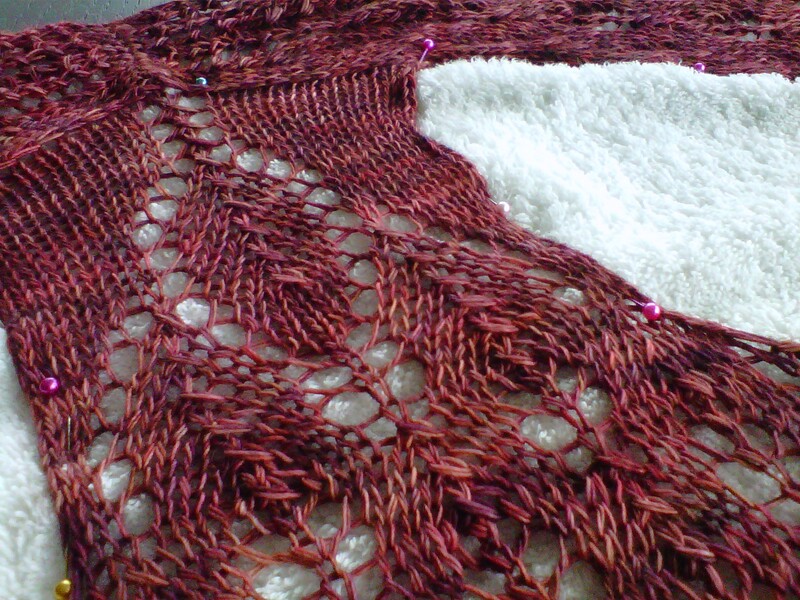 The pattern called for lace weight yarn held doubled. Love the pattern have some beautiful lace weight in “my stash”. But……the pattern called for 900 yards. I have 840 yards. This is Madeline Tosh Prairie, in Byzantine. I really want this vest out of this yarn. I can see this vest in this yarn. So I did a little research on Ravelry to see just how much yarn everyone was really using. The numbers were pretty true to what it called for in the pattern, but……some of the projects chose not to add the i-cord around the armholes and front edges. Bingo….I can make this work…..or so I convinced myself I could make this work. First I swatched, but did not block the swatch. 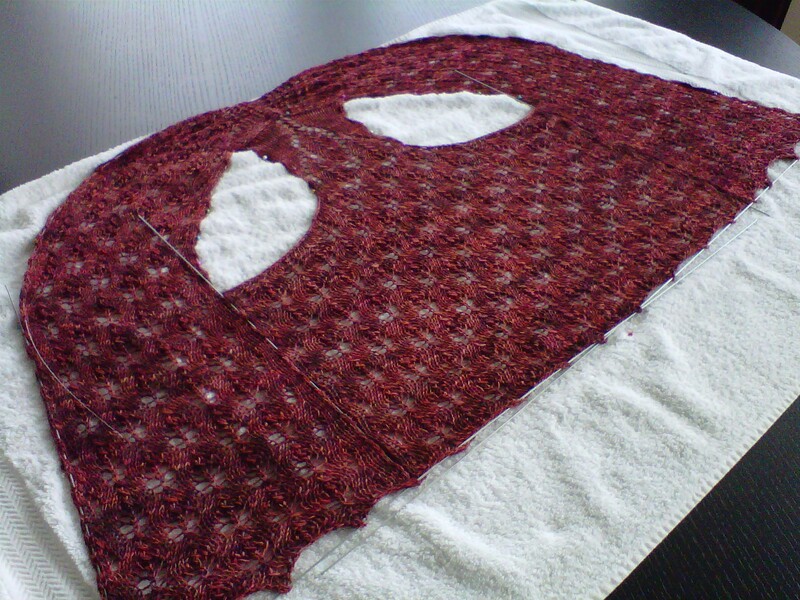 I took it off the needles measured without steaming or washing, just guestimating that I was going to come out OK. I knew I would need this yarn so I carefully ripped it back. Then the two strands of yarn problem. I had hoped that I could pull from both the inside and outside of the skein, nope, yarn was tooo sticky and kept knotting up. Did I say I needed every ounce, this yarn was not paying attention. Out comes the scale, and I wrap yarn into two balls, as equal as my scale would allow. Off and running again. I cast on three times, just to be certain I wasn’t leaving too much of a tail. Then the full on knitting began. It was beautiful! The pattern itself was a fascinating design, of picking up stitches without having to sew seams. It was looking good as I turned for the right front I started to panic……the balls of yarn were really small……there was a lot left to knit…..could I make it? I took it with me to Thursday Knit Nite…..hoping for encouragement. A look of doubt, maybe, good luck, knit faster….was all I got. I checked for more of this yarn in this color…..I was committed to this vest. No luck, I bought this skein last year…..it was not a this year color!!! So, I did what I had to do, what every knitter has to do…….keep knitting. I made it around the front, to the pickup of the back neck stitches, checking the remaining amount of yarn almost row by row….pushing thru, praying thru, drinking wine thru……thru to the finish line!!!! Yup, I made it!!!!! Even the three needle bind off for the neck edge! I had exactly 7 inches of yarn left on one ball and 11 inches of yarn on the other ball. Oh the exhilaration of pulling into the gas station on fumes! It is blocking…..there will be no i-cord edging for this one. I don’t think I will miss it. But she is a beauty! Absolutely gorgeous! The yarn gods were with you, but how could they not with such a beautiful vest! I love it……your creativity and “stick to it” ideology in life and in knitting, far outweigh any old pattern…..well done dear friend!! !